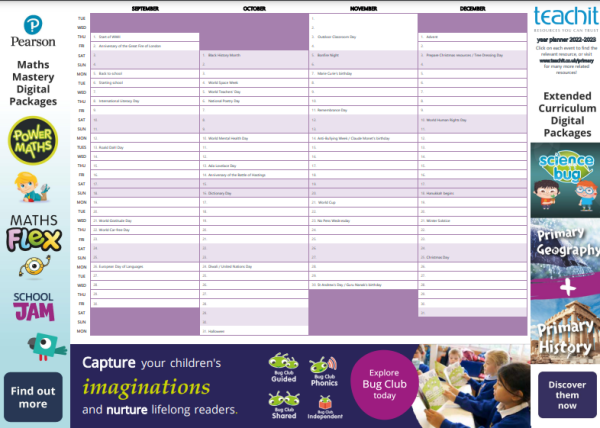 Including hyperlinks to topical, downloadable resources, this handy year planner will help you prepare for the year ahead. Each of the featured events is linked to a relevant resource. Download to your desktop or print for your class noticeboard. A really useful resource. Thank you. Thank you so much for all your positive reviews. We will keep updating this resource so be sure to send in any of your resources linked to significant dates. Thank you so much for all your positive feedback. We wish you the best of luck for the year ahead! This is simply beautiful! Very useful. Yearly views are always useful; a whole 12 months in perspective! Thank you for your comment. We are sure you will find it very useful for the year ahead.